How many you participate in some sort of sport, whether it is walking, swimming, hiking, cycling, rugby or running? How many of you prefer a more laid back lifestyle? Regardless, this post is for everyone. I was recently approached by an American brand to review one of their products. Nuun (born in Seattle, and pronounced 'noon' in case you were wondering) sell electrolyte enhanced tablets-they call them tabs- that you pop into a bottle of water to magic-ify (only right to make up a word for Nuun!) and voila you have a fruity-flavoured water drink. It's a very unique product in that whilst it is primarily advertised as a sports drink tablet, Nuun can be drunk by anyone; looking through their instagram account is enough to show this. Nuun followers drink it throughout the day and evening, whether for sports or non sports reasons. In simple terms, the Nuun Hydration electrolyte tabs replace the electrolytes (sodium, potassium etc) you lose when you sweat. I am so happy I had the opportunity to review Nuun, I honestly had a lot of fun playing around with the product and I will definitely be purchasing Nuun Hydration again. 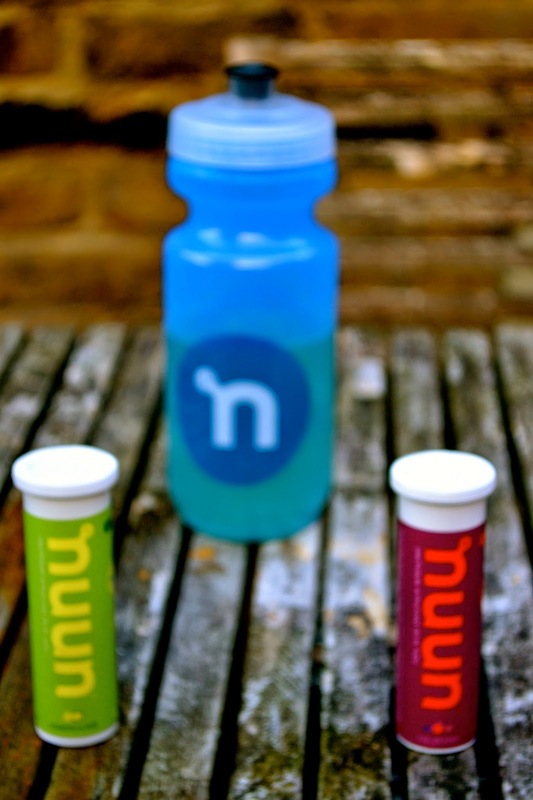 H20 + Nuun tab + bottle + 2 minutes waiting time= your nuun drink. You can drink this during your exercise but also as a drink with a meal. You can also drink this as a post or pre workout drink to get some energy. But not just that, Nuun states (albeit in small writing) on the tubes that you can re-use the tubes and they make a lot of noise about this. This is where the fun really kicked in when testing out the tabs. I played 3-pin bowling with the three tubes I was given. During lunch at work, we took a Nuun tube, scrunched up a piece of paper into a ball, and then attempted to either flick or throw it at the Nuun tube with the aim of knocking it over (yes, I'm cheating in the video below, sshh!). Also, when I finished one of the tubes, I found that they are brilliant for storing midday snacks, like almonds or dates. The size of the tubes means they can fit in any bag, which makes them ideal for those of us with small handbags or clutch bags. Plus, for the guys, I think you could hide it away in the inside pocket of your blazer or suit jacket. I gave some to a few friends and they told me that they also found Nuun to be a perfect hangover drink....how many sports drinks can you say do that too? Bloody marvellous product if you ask me (mind my French). Why not go wild with your imagination and get creative with the Nuun tubes. See what you can else you can do with them. Post your photos on instagram and twitter using the hashtag #nuunlife and tag Nuun and myself! With regards to the tablets themselves, Nuun provided me with three flavours; lime & lemon, tri-berry and tropical. I absolutely disliked Tri-berry because I found it too sweet and the berry taste a little overwhelming. Then again, I rarely like berry flavoured drinks, so if you usually do, then you may like this one. However, I loved Lime & Lemon and Tropical. Those two flavours were much more subdued and felt much lighter in taste and far more refreshing and energizing during long runs. The first time I tried Tri-berry, I was completing a 5km and when I took that first sip I was taken aback by the sweetness of it. Also, on the really hot days I ran with Tri-berry drinks, I found that if I spilt the drink, it would get a little sticky. I have never encountered that problem with the other two flavours. I'm not sure if I was having a bit of a blonde moment, but the first time I tried a Nuun electrolyte tab whilst running, I didn't realise that they turned the water into a fizzy drink so that was a complete shock to the system during that run. However, once I got used to that, I was fine with drinking a fizzy drink during my workouts and I really grew to liking them. In fact, after each running or gym session, I ended up longing for a Nuun drink. When one of my younger cousins came over one weekend, he saw me making my Nuun drink for a 10km run and he was so fascinated with the way the tab fizzles away, it was quite amusing watching him be so entertained! Health-wise, Nuun electrolyte tabs are fantastic because they contain no carbs or sugars so you really are focusing on replenishing your electrolytes and energy levels with this. I tried three flavours from the Nuun Active Hydration range but the full range is made up of twelve different flavours including Strawberry Lemonade (I'm dying to try that), Watermelon and Fruit Punch. I haven't come across Nuun in my go-to specialist running shops (Runners' Need and Sweatshop in case you forgot), but you can purchase the Nuun Active Hydration range on the Nuun website. They sell them on their American and British websites as well as on Wiggle and Amazon. Have you tried Nuun Active Hydration? Let me know what your favourite flavour is! ﻿﻿﻿﻿I asked Nuun if there was a story behind the choice of the brand's name. They told me that Nuun doesn't mean one single thing but it does mean optimal hydration that tastes delicious, in a sustainable and a rather chic manner, with a nifty logo they like to plaster everywhere. And I think their definition of Nuun is right on. I for one will be leading a more #nuunlife. It's all about Nuun's Lemon & Lime baby! Disclosure: Nuun provided me with the Nuun Active Hydration tabs. This review and all my opinions are are honest and all my own.